With all our advances in astronomy, is there no simple, scientific solution to the annual saga of “when do we start the month of Ramadan”, asks Nidhal Guessoum. Since the Islamic months follow a lunar calendar, the start of each month is marked by the first sighting of the crescent moon. Each year, as the holy month of Ramadan approaches, the endless debate about the start of the month heightens, often with embarrassing consequences. Countless discussions and debates have so far failed to agree on how to resolve this issue once and for all. Why does the Islamic world find it so difficult to determine the start of Ramadan and the occurrence of the holy days of Eid and Hajj? Why can’t astronomy solve this seemingly simple problem? 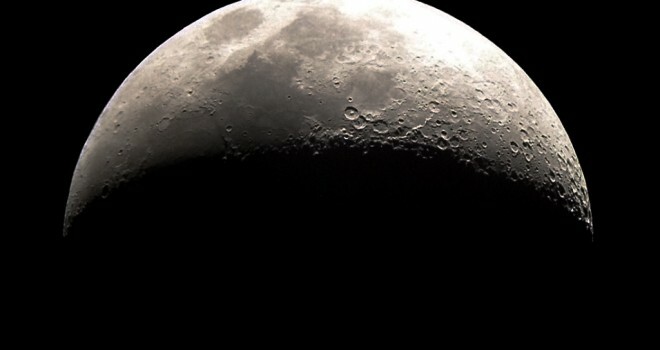 If science can take humans and robotic crafts to the moon, explore every spot on its surface, search for ice in lunar craters, and send spacecrafts and probes to the outskirts of the solar system, can it not determine the position and illumination of the thin crescent, which signals the start of Islamic months? As I will explain, science is not responsible for the widespread confusion that engulfs the Muslim world each year just before the beginning and end of Ramadan. Still, and before exploring the reasons behind this state of affairs and proposing solutions to the problem globally, it is important to understand its scientific aspects and see how much progress has been made in this field over the last few decades. Firstly, a simple distinction must be made. The determination of the moon’s position around the Earth at any given moment and from any specified location is different from the prediction that one will, or will not, see the thin new crescent that appears shortly after the moon has started a new cycle around the Earth. The first aspect has always been relatively easy for astronomers to solve since the earliest times of the Babylonians, Greeks and Muslims. Today, celestial mechanics has achieved great accuracy. Fast computers are able to solve complicated equations, taking into consideration all factors and effects, such as the gravitational pulls of the Earth, Sun and nearby planets. Surprisingly, determining if the moon would be visible, which sounds like a rather simple task, is much more complex. However, it is far from unsolvable. Astronomers have always realized that the observation of the crescent is affected by atmospheric factors, such as turbulence in the air, humidity, dust, and pollution. This is especially true when the crescent is low in the sky, near the horizon, as it always is at the start of the lunar month. Moreover, these effects vary from one location to another and from one evening to the next. And this is why astronomers, from Babylonian times to the late 1970’s, resorted to simple geometrical rules constructed empirically. 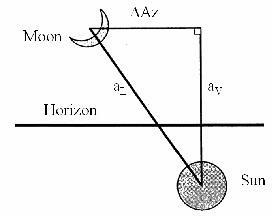 As can be seen in the figure, angles are simply defined for the relative positions of the crescent, the sun, and the horizon relative to the observer. This way, a rule for whether the crescent will be visible or not at that specific time and place can be calculate with these angles. For example, the oldest such criterion, the Babylonian one, states that the crescent is visible to the naked eye if at the moment of observation, the arc of vision (angle between the moon and the sun) exceeds 12 degrees. This (approximate) criterion was adopted through the ages by various peoples for whom the moon was the basis of the calendar, whether for religious or civil purposes. Muslim astronomers, including the great Al-Battani, Al-Farghani, Al-Biruni, and Al-Tusi, approached the problem in similar fashion. They obtained limiting values between 9.5 and 12 degrees. No progress was made until the beginning of the twentieth century, when Western astronomers looked at the problem and found it very interesting. First, the same empirical approach and geometric criteria were sought. Fotheringham (1910) and Maunder (1911) collected data from longer periods and wider regions and found that the minimum arc-of-light angle for seeing the crescent was indeed around 11 or 12 degrees, but only when the relative azimuth (the horizontal angle) between the moon and the sun was zero; the greater the azimuth, the smaller the arc of vision required to spot the cresent. In 1932, Andre-Louis Danjon determined that the crescent could never be seen by the naked eye if the moon-sun angle was less than 7 degrees. This became known as the Danjon limit, which has recently been reduced to 6.5 for the naked eye and 5.5 degrees for telescopes. The 1970’s and 1980’s saw interesting and novel developments. First, Bruin (1977) realized that, as the problem largely depended on local atmospheric factors , it should be treated by physics rather than geometry. Thus he proposed a new model. The contrast between the moon’s brightness (which could be calculated geometrically from the moon’s position relative to both the sun and the observer) and the background sky (which depends on local conditions) is determined. This contrast is then compared to the minimum brightness that the naked human eye (or the telescope) can see. This results in a prediction of the visibility of the crescent on any specific night from any specific location. During that same period of time, the Malaysian astronomer Mohammad Ilyas did two things . First, he constructed a new geometric criterion similar to the old model but slightly more accurate. He then introduced a new concept, the Lunar Date Line, which divides the world longitudinally into two regions. To the west of that line, the crescent will be seen in the night sky and the month will start the following day. All regions lying to the east of the line would not be able to see the crescent, thus the start of the month would be delayed by one day. It is important to realize that this line changes each month, is not smooth, and has some margins of uncertainty. More models followed over the years, both of the physical type and of the geometric type , . To recap, one can say that today we have good models and accurate criteria for knowing where and when the crescent can or cannot be seen. Atmospheric conditions are difficult to predict locally, of course, and so the accuracy of crescent visibility predictions are specific to that region. For practical purposes, a country, or state prediction should suffice. Why then are we Muslims still in disarray when we want to know the start of our holy months? Because society, and especially most of its religious leaders, still insists that a month begins when the new crescent is seen by eye. This requirement tends to lead to disharmony between Muslims around the world. Studies have shown that honest mistakes will be made by people when observing the new crescent, even when the crescent is absent from the sky. Investigations by a number of researchers in Algeria, Jordan, Syria and Saudi Arabia have found that over the past 50 years, between 50% and 90% of holy occasions have been wrongly declared based on eye-witness reports,. As long as we insist on sightings on the eve of a month, especially observations made by the naked eye, we will make mistakes, leading to disagreements within countries and between states. That is why nowadays we find Ramadan starting and ending in the Muslim world over 3 or 4 different days. So what is the solution to this conundrum? It is simply the establishment of an Islamic calendar and using it for both religious and civil purposes. Saudi Arabia does have an Islamic calendar (the Umm al-Qura calendar), but only for civil purposes, such as the payment of salaries and scheduling school holidays. However, this calendar is routinely violated every time someone reports having seen the crescent on a holy occasion and the authorities accept their testimony. Are Muslim astronomers today able to construct a calendar that can be fully implemented for religious and civil purposes? Yes. Indeed, after years of work and deliberations in meetings and conferences, two calendar proposals have emerged. The first is the unified calendar  based on a single rule for the start of any lunar month everywhere in the world. The second is the bi-zonal calendar , put forward by Mohammad Odeh and myself, which splits the world in two (the old continents and the new world) and devises two slightly differing calendars (which agree about 75% of the time and differ by a day in other times). It may seem obvious that the unified calendar is a better one – and hence to suggest a bi-zonal calendar seems superfluous – but there are pros and cons to each proposal. The unified calendar does not ensure enough concordance with the crescent’s visibility in the Islamic world, while the bi-zonal calendar gives up some of the unity but ensures (for the religious authorities) that the months are almost fully in accordance with crescent observations. And so if the problem is fully understood, and Muslim astronomers have laboured hard and devised good solutions, why is the Muslim world reluctant to adopt either and solve this long-standing and disturbing socio-religious problem? Because many still find it difficult to go beyond the old traditional ways of observing the crescent on the night of doubt. in order to determine the start of the month. Once this mental block has been removed, the problem will be solved rather quickly and easily.